After three days, it was time to leave London. We picked up our rental car and started the adventure of driving on the left with a manual transmission! First stop was the White Horse of Uffington. 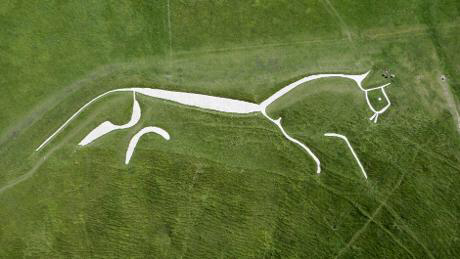 A chalk figure of a horse, visible in its entirety only from the air, created from somewhere between 1500 to 300 BC. Consisting of deep chalk trenches it is unclear just what it’s purpose was, but it has been cared for by local populations through the centuries. The horse lies on the side of a hill along the Ridgeway – an ancient road used today by hikers. We fought high winds up the hill and across a sheep pasture to reach it. The entire horse is about 350 feet long and, up close, there is no way to tell what it is. But from the air, or at a distance from the correct angle, it all comes together. Further on, at the top of the hill is Uffington Castle – an Iron Age hill fort that was later used by the Romans. Over 2 acres in size it held a commanding view in any direction – easy to see why it was chosen as a site! From Uffington, we stopped into a nearby pub, the Fox and Hound for lunch, and then drove on to Barbury Castle, another Iron Age hill fort found along the old Ridgeway. Bigger than Uffington, Barbury was also perfectly situated on a high hill and continued to be used for defensive purposes for centuries. Farther south lies Avebury, the largest Neolithic stone circle in Europe. Estimated to have been constructed around 3000 BC, Avebury consists of three rings of stones. Like other Stone Age sites, the exact purpose is unknown, but clearly had ceremonial significance. Many of the stones were destroyed in the Middle Ages, but since about the 17th century there has been an active effort to preserve them. We wandered among the stones marveling at the ingenuity and dedication it took to bring the stones from miles away and erect them here in this place. In medieval times a village sprung up nearby and eventually extended inside the henge itself. It still feels every bit the medieval town with thatch roofed buildings. A Norman church from the 12th century sits near the edge of the village surrounded by the churchyard and what was once a working garden and farm. Everything about Avebury – the stones, the village – was beautiful, evoking a sense of peaceful calm. Just a short distance from Avebury is Silbury Hill, a chalk mound built more than 4,000 years ago. No one knows why. 130 feet high, it is largest known man made prehistoric structure in Europe. Excavations have revealed nothing about its purpose. Another short distance, about a half mile off the main road, sits the West Kennet Long Barrow. A Stone Age burial chamber, it aligns with the rising sun on the summer solstice. We went inside the chambers and walked atop the mound itself taking in the beauty of the landscape.